Burgin Field | GirlGuiding New Zealand - You be the guide! Burgin Field in Auckland is a unique Waitakere experience for adventures - available for day hire or overnight camping set in ten acres of Waitakere bush. Burgin Field in Auckland is a unique Waitakere experience for outdoor adventures set in ten acres of Waitakere bush. It is grounds only and is available for day hire for outdoor events or overnight camping. Anything taken into the bush must be taken out. If building a bivouac, please ensure it is dismantled and the materials left in a tidy manner before leaving. If using the outdoor fires, please ensure they are cleared of all ashes and left-over are returned to the wood sheds. Native trees, stream and a range of different bird life can be seen on the ten acres of bush walks within the property. Can be spotted by the stream, usually on the opposite bank. The double garage is not included in the hire of Burgin Field. 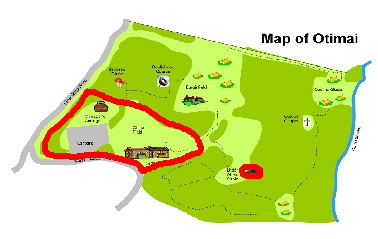 Please note you are unable to use the sections marked in red as there is a long-term lease in place for Otimai Lodge, Managers Cottage, Little Otimai and this part of the grounds.